"You might not remember me, but --""Travis Stephenson," she interrupts, her words like a roadblock. "Welcome home. Now leave me alone. "It's always nice to come across a book that has a little bit of everything. 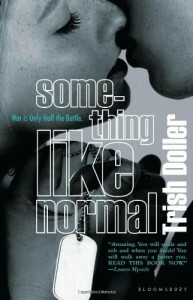 Something Like Normal definitely covered its bases in the emotion department. If there was an emotion left to be discovered, I couldn't tell you what it was. Everything from fear, anger, joy, sorrow, caution and anticipation was explored. This particular (male) narrative was somewhat different because his story revolves around living life while continuing to suffer from Post Traumatic Stress Disorder due to his lingering pain and recollections of what happened during his time spent on tour in Afghanistan. "I left everything the way it was," she says as I drop my bag on the floor. "So it would feel familiar. Like home." I don't tell her that it doesn't feel like home at all.The voice of Travis sounds like the voice of a guy you might know. When he's not suffering from reliving the harsh reality of his life through nightmares, he's drinking and fighting and screwing just like any other guy. I appreciated the balance in his tough guy persona as he explored a missed opportunity of being with the girl he'd always had his eye on.Harper comes up alongside me, all green eyes and tousled hair. I could probably look at her forever and not get tired of that face.She's a good kisser. So good I want to beat the hell out of whoever taught her.She beams at me and it's almost enough to make up for the fact that I'm harder than trigonometry right now.Okay, so maybe those lines bordered on cheesy but they made me smile. It's always nice to see a bit of sweetness or humor interjected into a serious subject. There was a diner scene which happened to be quite funny. It's not quite as good as another famous diner scene from another book but I still had a big grin on my face while reading it.It was also nice to see the bond between male friends who have been to hell and back through war, yet can still joke around with each other. "I still have my half of the necklace, and last night I wrote in my diary, 'Dear Diary, Kenneth is my BFF. I hope he gets laid, because it's a special night when a man loses his virginity and contracts a sexually transmitted disease at the same time. '"I thought I was safe from the crying thing because for whatever reason, the flashback scenes sort of played out in my head as an old black and white movie and didn't seem to completely move me. Then the last couple of chapters happened and a lone tear fell from my eye (cue sad music). Don't worry though. The book has plenty of hope to go around. I thought the author did a great job of showing the rough road of healing that was ahead for our main character.If I had to mention one of my favorite things about Travis it's that he was not without flaws, yet he still managed to recognize and take responsibility for the bad things he had done to the one girl who had every right not to forgive him. Watching the relationship develop between Travis and Harper was sweet to witness. Neither one was able to guarantee the other much more than what they could give in the moment and I liked that. Realistic relationships for young people = my stamp of approval.I can't make that kind of promise when I'm only nineteen and owe the Marine Corps three more years of active duty. Anything could happen.If I had to come up with any complaint it would be that there were a few moments which made me feel uncomfortable as Travis described the enemy. I do understand though that this is the "trained" mentality of war. War forces you into an us vs. them, regardless of who you're fighting.This was a sweet book with a realistic love story. War is not pretty, nor are the aftereffects, but it was nice to see that hope does have a chance of winning out with the right support system around you, whether it be friends, family, or a special loved one.I don't know if my life will ever be completely normal again, but something like normal is a good start.